Evolved in its design, both inside and out, the Samsung Galaxy Note 3 is more innovative than ever. The new exterior is a whole new take on the Samsung Galaxy experience. The sleek magazine-style viewing option always keeps your favorite content right at your fingertips. And the S Pen is a better way to control, write, and get more done. 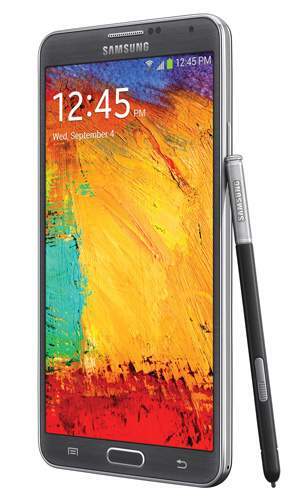 The Samsung Galaxy Note 3 with refined S Pen. But even with its advanced features, the Galaxy Note 3 is still simple to use. With features like touch-free voice control, smarter file search and a hassle-free way to transfer your existing content -- it's a simplified experience. 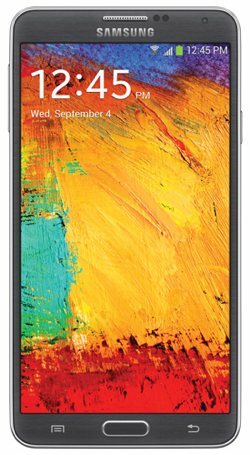 The Galaxy Note 3 features a wider 5.7-inch Full HD 1080p Super AMOLED display, yet it's slimmer and lighter than its predecessor (8.3mm and 5.93 ounces, respectively) and has a more powerful and longer lasting 3200 mAh battery. It's also equipped with a 13-megapixel rear camera with Smart Stabilization and an improved LED flash to help you capture every visual story in your life -- even in low light and active situations. Running the Android 4.3 (Jelly Bean) operating system, the Galaxy Note 3 is powered by a 2.3 GHz quad-core processor. 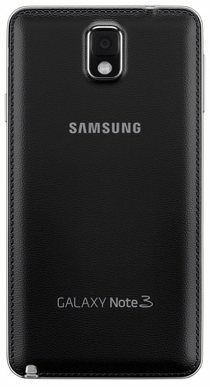 It features 32 GB of internal storage, which can be expanded using optional microSD memory cards up to 64 GB. Everything that matters to you is just a glance away with the magazine-inspired interface, where you can curate content tailored to the things you love. Get instant updates on your favorite sports teams or celebrities, check a live Facebook and Twitter feed, or get suggestions for the best place to grab lunch down the street. Interact with your phone like never before using S Pen. Handwriting input lets you jot notes, compose emails or write text messages by turning your handwriting into text. You can quickly jot down a number and then automatically add it to your contacts later with Action Memo. And if you use your S Pen a little more creatively, you can share your creation with the world on Pen.Up. Make memories unforgettable with the Samsung Galaxy Note 3's 13-megapixel camera. It uses the same interface as the Samsung Galaxy S 4 and the Galaxy Camera so you can remove photo distractions with a touch using Eraser or capture every frame of the perfect cannonball with Drama Shot. Keep track of what catches your eye with Scrapbook. See artwork that would go perfectly with your newly remodeled living room? Clip it with S Pen and add it to your living room board. You can also clip and pin web pages, videos, text and more. Now you can keep inspiration close at hand. 5.7-inch Full HD 1080p display. Turn your Samsung Galaxy Note 3 into a universal remote control with WatchON. Plus you can find out what's good on TV with WatchON's reinvented TV guide. You can tell the app what your favorite shows are, and it will let you know when they're on and even recommend other shows you'll love. Have a certain movie in mind? Use one-stop search to quickly find the best way to watch it. With the new voice control feature, your phone starts listening as soon as you say "Hi, Galaxy." Send messages, make calls and more without ever touching your phone. That's true voice control -- no buttons, no hands, no confusion. There's a better way to send photos, videos, music and documents to friends, family and coworkers. With S Beam, just tap two compatible Galaxy devices together to get content to another device instantly. Sharing has never been this easy. Don't lose track of things on your phone. With S Finder, just one click of the S Pen button lets you easily search just about anything on your device, including emails, text messages, contacts or web history. You can even search for handwriting or symbols. Or browse by date, so you can easily find the note you made after your meeting Monday morning. Now there's no reason to wait, because we've made switching easier than ever. Load your iTunes backup right onto your new phone to easily transfer contacts, calendar events, messages, photos and more. Plus Samsung Smart Switch can automatically find your favorite apps on Google Play and recommend similar ones if there's no direct match. Easy Mode is a setting you can use to simplify your home screen with bigger icons and your favorite apps, so you can take your time to discover everything your new Samsung Galaxy Note 3 can do. An even sweeter Jelly Bean, the Android 4.3 operating system's Android 4.3's new restricted profiles feature can be used to limit access to apps and content -- at home with your family and at work. Fast, fluid, and smooth, Android 4.3 offers effortless movement between home screens -- like turning the pages of a book. And it includes faster orientation changes, quicker switching between recent apps, and smoother and more consistent rendering throughout your mobile device. Browse and download thousands of free and paid apps from around the world via Google Play or the Amazon Appstore for Android. Restricted Profiles. Put your tablet into a mode with limited access to apps and content. For example, a parent can set up profiles for each family member, and a business manager can set up profiles that keep employees focused on work. Built-in Security Protection. Android is designed to keep you and your data safe. Every app runs in its own sandbox, a secure space isolated from other apps. And whenever you download an app, Android can automatically scan it for viruses, checking apps against a database maintained by Google. Expandable, Actionable Notifications. Android has always put you in control when it comes to staying notified and connected. Just swipe down from the top of the screen to see all your notifications in one place. Late for a meeting or missed a call? Take action in an instant directly from the notifications shade. Smooth Operator. More reactive and uniform touch responses mean you can almost feel the pixels beneath as your finger moves across the screen. .
Live in the Now. With Google Now, you get the right information at just the right time -- before you even ask. It can tell you today's weather before you start your day, or when the next train will arrive as you're standing on the platform. .
Smarter Keyboard with Gesture Typing. Just glide your finger over the letters you want to type, and lift after each word. You don't have to worry about spaces because they're added automatically for you. Beam Photos and Videos. With Android Beam, you can easily share your photos and videos.